Inside fashioned after a grand Castilian opera house, the Ventura Theater, in it’s three story Spanish Colonial Revival building, opened it’s doors on August 16, 1928, to an enthusiastic and packed house. The Ventura Theater fit the movie palace concept of ornateness and grandeur to a tee. Theater patrons felt as if they were in another world, one of gilt and opulence, as affirmed by the lobby’s elaborate ceiling decorations of gold leaf, carved figures, chandeliers and wall sconces, and the double stairway with wrought iron handrails, that lead up to intimate balcony seating. In the lobby, stood a model of a 17th Century Spanish brigantine ship and was lined with Spanish antique furniture, chairs and sofas, for theater goers to enjoy and relax in pure luxury. Telephone connections were installed throughout the building, many reserved for patrons to use, at a time when using a public phone line was standard practice. The interior of the huge theater auditorium, with it’s stenciled ceiling beams, tremendous lighting system, deep sky blue painted ceiling, behind a one of a kind sunburst ceiling decoration, all contributed to the feeling of ultimate style and elegance. The most expensive decoration still remains in the Ventura Theater, the 40 foot “sun” or central bowl like piece which conceals the main ceiling ventilator and suspended from it, the infamous handmade sunburst chandelier. Today the Ventura Theater continues to provide Ventura County with the best and most diverse entertainment. The Ventura Theater has been honored by legends such as Ray Charles, Willie Nelson and B.B. King to is also a place that’s nurtures future musical icons, like Bruce Springsteen, Peter Gabriel, Red Hot Chili Peppers and Pearl Jam. From music concerts to cult movie showings to variety shows and special musical productions produced by the community, The Majestic Ventura Theater is the historical staple of entertainment in downtown Ventura, CA. 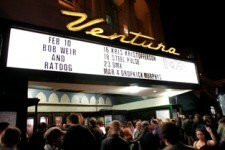 Located in Ventura, California – minutes from the Valley and Santa Barbara, it is one of Southern California’s finest venues and home to the world’s most legendary artists – of all genres of music to include but not limited to: Punk, Alternative Rock, Reggae, Classic Rock, Metal, Blues, Country, Jazz, Funk, Latin, Rock en Espanol, Electronica, R&B/Trip-Hop/Hip-Hop, World and more. The Ventura Theater’s 1920′s Mission Style Architecture design, 1200 capacity spectacular venue, with multiple full bars, ballroom and the occasionaldinner show continues to enjoy the best talent line-ups North of Los Angeles to San Francisco.